Our new Vestfrost fridge has arrived and it’s a beauty. It looks a bit different than most North American fridges in that it is tall and narrow. It has a 24 inch x 24 inch footprint and it about 7 feet high. As my mother noted, it wouldn’t work in most kitchens but it’s works for me. The topmost shelf is a bit of a stretch but it is designed for bottles (likely wine bottles) on their side so you don’t need to reach to the back. I will have to figure out how I will use it most efficiently, or maybe just keep a step stool handy. The fridge is set up in the garage right now but once we begin using the kitchen in the house it will move over and take up residence in the cool closet. The cool closet is an insulated pantry in the kitchen that will be cooled by either outside air (in the fall/winter/spring) and by air from the basement in the summer. We are hoping that this setup will mean that it doesn’t need to run at all during the short-on-sunlight days of winter. The Vestfrost has 2 compressors, both located in the back bottom of the fridge, one for the fridge and one for the freezer compartment. Only the compressor needed runs to cool the required section. And if necessary, you can shut one section right down. The doors have a great seal for reduced air leakage. In addition, the freezer has drawers for your food so when you open the freezer, all the cold air does not spill out. The drawer idea is great for conserving energy and organization, but it does mean you can’t store all that much in it. We will continue to use our small chest freezer (which will be stored in the porch on the north side of the house, outside the kitchen), and use the Vestfrost freezer for the stuff you want to keep handy. After years of using a small bar fridge I am loving all the fridge space. It even has a neat 1 inch space at the top of the freezer, just big enough for ice cube trays. The Vestfrost is a Danish fridge. We purchased it through Oasis Montana Inc. They were very helpful and the fridge was shipped quickly, without any damage. 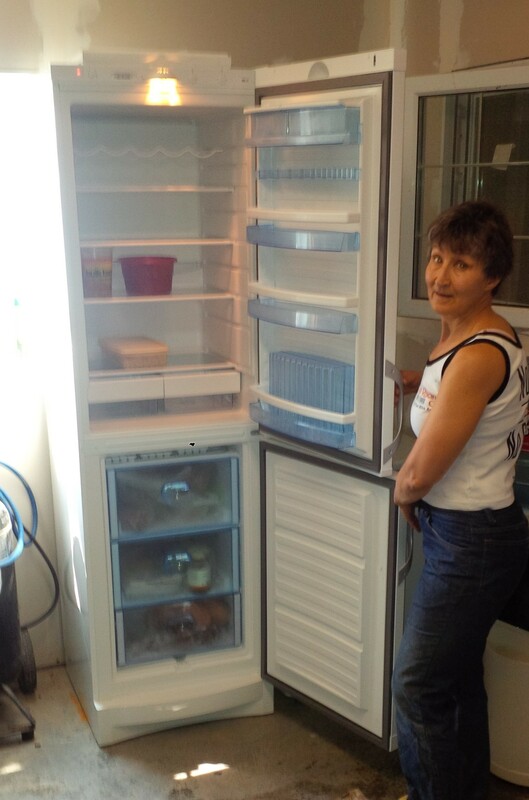 This entry was posted in Cooking, Food, Home, Kitchen and tagged cold room, cool closet, energy efficient fridge, fridge, refridgerator, Vestfrost. Bookmark the permalink.